This first study of John McGahern’s fiction consists of readings of the first five novels, The Barracks (1963), The Dark (1965), The Leavetaking (1974), The Pornographer (1979) and Amongst Women (1990), and of the three volumes of short stories, Nightlines (1970), Getting Through (1978), and High Ground (1985). While these readings are set against the Irish circumstances which informed the novelist’s experience and thinking, the larger goal is to situate this body of fiction in a European tradition of symbolic realism. As in Beckett, Proust, or Yeats, writers whose presence can be felt in McGahern’s work, the sum is greater than the parts, for he is one of those exacting artists who invite the reader to circle back over known territory, searching the familiar narratives for the renewal of imagination itself as the vital and redeeming power. “Sampson’s study is clearly written, its critical abstractions well and truly digested; and having read it, one feels that growth in knowledge and familiarity with the subject which comes from having been in the presence of a genial instructor. It is a richly rewarding and extremely readable study.” Eamon Grennan, Canadian Journal of Irish Studies, 1996. “I found Denis Sampson’s study of the novelist both stimulating and provocative, principally because it offered me a very different McGahern from the one I felt I had come to know myself. The critic has, in fact, done his subject the best kind of service by sending me back to the work itself to have another look.” John Cronin, Linen Hall Review (Belfast) Winter 1993. “The author’s sharp scrutiny of McGahern as a person and artist makes this first book-length study of McGahern of high value and indicates that much of the best scholarship in Irish literature is being accomplished outside of Ireland.” F. L. Ryan, Choice (American Library Assoc.) October 1993. “With this thoughtful and provocative assessment, Denis Sampson gives us a much needed, painstaking and valuable scrutiny of the author. As a scholarly tool, it is invaluable. Sampson’s excellent book should stir renewed discussion about McGahern’s prose fiction. I welcome Sampson’s book: its well-argued positions excite the reader to reexamine the richness and complexity of McGahern’s oeuvre.” Eileen Kennedy, Irish Literary Supplement, Fall 1993. “A very good book: methodical, perceptive and unassuming. Both implicitly and explicitly, Sampson takes issue with readers and critics who perceive McGahern’s work as being merely autobiographical and realistic. Sampson’s is an original and well-defended argument. 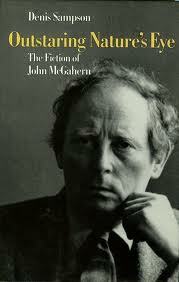 John McGahern’s work has been well served by these thoughtful, serious readings.” Jo O’Donoghue, Studies, Spring 1994. “In addition to being an excellent study of McGahern, Sampson’s book is also a most valuable general introduction to Irish fiction since the death of Joyce: it is a study that shows how and why Irish fiction has developed as it has in the shadow of modernism.” Eamonn Wall, Review of Contemporary Fiction, Spring 1995. “This study must be the starting point for any scholarly discussion of McGahern’s work. It is a brilliant and detailed discussion of McGahern’s fiction. . . . An outstanding work of scholarship and analysis to which all those who work with McGahern’s fiction are indebted.” David Malcolm, Understanding John McGahern (2007). Outstaring Nature’s Eye: The Fiction of John McGahern was published by Catholic University of America Press, Washington D.C., 1993, and in Dublin by Lilliput Press, 1993.